Decimal to fraction converter will easily convert numbers to fractions and vice versa. To convert a decimal number to a fraction, select "decimal to fraction", enter a decimal number using the decimal point "." as separator (eg. 1.23) and press "=" to calculate the equivalent fraction. 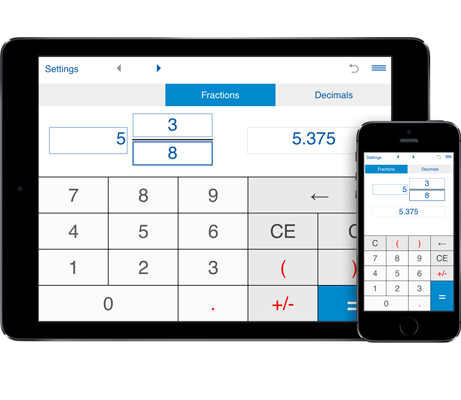 This decimal to fraction calculator will quickly convert decimals to fractions. You can use it for both regular decimals and recurring decimals. The decimal to fraction converter shows the results as a fraction or mixed number in simplest form. 1. Select the "decimal to fraction" option. 2. Enter a decimal number you want to convert to a fraction and press "=". The calculator will convert a decimal to an improper fraction, reduce that fraction if it can be reduced, and show the results as a proper fraction or mixed number in simplest form. When a number has no repeating decimal portion (terminating decimals or non-repeating decimals), enter the number with the whole part separated from the decimal part by a decimal point (ex. 12.34). When a number has infinitely repeating decimals (or recurring decimals) you should enclose the repeating digits in brackets. Ex. if you have 0.24333... as decimal, type 0.24(3). If the number is 0.123123, type 0. (123).